....it was difficult to get back to the blog after being away for a bit. While it takes 21 days to form a habit, it takes all of 2 1/2 seconds to end one! And blogging has become quite a habit for me. I can see now that I can't post here and there...that I must post daily (or only miss a day here and there) or I will not come back to it. And I would miss you all terribly if I didn't return! This week is the Fall Home Tour hosted by Brenda at Cozy Little House. I am so thankful that she included me in this tour, as it is my very first time to participate in a blog hop. I'm glad I will be bringing up the rear...it will give me an opportunity to get a few more things in order! .....and a little sneak peek. You really are pulling it all together fast. I can't wait to see your home tour on Friday. Don't stress yourself out. Hey posting every day is a lot. If you post once or twice a week it will be great. Do not put that stress on yourself. Have a great week. Thanks so much Kris! I've decided to not sweat it. :-) We will be finished with the move and decorating soon and then I can start some of those projects! :-) Hope you are feeling much better! Every day!?! We are happy when you show up. No stress. I see pumpkins. LOL…I’m happy when I can show up also! 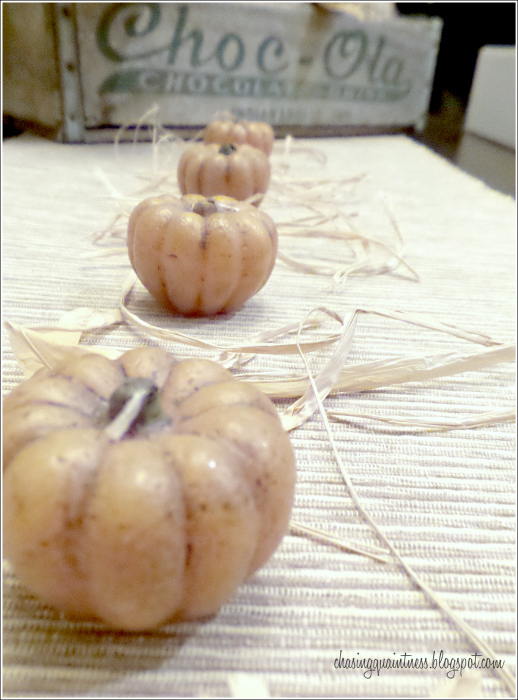 I’m working on some pumpkin décor! No internet till then? Geez, I'd be hopping mad about that. Don't stress yourself. You've already been stressed enough over this move. If I had to show off my newly moved-into home, I'd commit harri-karri (however it is spelled)!!!!!! Wanna know what I REALLY WANT TO SEE???? It's always fun to stop by your blog, but hey, everyone needs a break now and then no matter what the reason! Looking forward to your tour. Thanks so much Christine! I've had those little pumpkin candles for years....and I won't light them...LOL. I keep them neatly tucked away in the fall storage container so they won't get damaged. I've not been able to find anymore since. Hugs!! Can't wait to see your home tour!! So true and I dare him to say 2 words about my blogging time when he gets me for dirt cheap as an HR/Payroll admin.....LOL Thanks so much! Hugs!! What you're doing right now would totally overwhelm me, and I think I'd be putting the blog on hold. But I'm glad you're sticking around. That internet situation though...that's just wrong. Yep, the internet is frustrating, but much like the fridge, we are making it work…hopefully not too much longer on the fridge or internet. It’s those little things that get ya! :-) I’m one of those people that need structure and routine, so the blog helps keep the routine for me. I can't believe you are participating in the tour with all you have going on. And posting nearly every day?? No way. I post once a week and it's perfect for me. Don't stress. It will just burn you out faster. I'm glad I'm coming up the rear too. I don't usually decorate much, and certainly not this early! I’m glad I’m doing it also. It’s a little bit of a challenge to get things in order, but it is motivating me to get those boxes unpacked rather than let them sit for weeks on end. Well since we are being complete honest today – I confess I don’t get it at all. Sept 2nd you closed on your new house, have moved and presumably unpacked because you are Hosting a Fall Home Tour on Friday the 18th a mere 16 days after you closed - girl you set the bar high! Somebody contact Amara and have them add a new Marathon category to their Blog awards cuz you amaze me with that whirlwind turnaround much less that you are still squeezing in new posts on your blog. Please take some time to relax and enjoy your new house we all luv you and CQ and will be reading whenever the mood hits you to post! I'm sweating bullet's for ya girlfriend !!! I know how organized and detail orientated you are, you probably have one of the most beautiful home's. ( they all will be , but my money's on you) Just please don't start any craft project's in the meantime. Haha Big Hug's , TT p.s. thank you for the awesome comment on Donna's blog about me, your the best !!! I'm sweating bullets with you!! LOL I've got a couple of craft projects that I want to try and will definitely need all the help I can get! LOL....so I expect you to jump right in and help!! :-) You are so welcome...meant every word and so you are you! Much love and hugs!! Congratulation on being part of the Blog Tour. Thank you for the click-able links to the blogs!!!!!!!!!! LOL….you are so funny! And thank you! I’m excited about the blog tour…never been a part of one, so I’m working really hard to get my part completed! :-) Hope you have a great week also Carla! Awww, Jemma, thank you so much! The hubster has other names for me...slave driver, over-achiever, obsessive-compulsive....but mostly a nervous wreck...LOL. Hugs...can't wait to see your home...going to take a peek now! :-) Hugs! !